In handcrafting furniture in the heart of western North Carolina, our pieces certainly have an Appalachian influence. But we often embrace time-honored Shaker detailing as we create new designs. Clean lines, subtle curves, minimal adornment, and particular focus on the unique character of the wood result in casually sophisticated yet multi-functional pieces. You can read more about ingenious Shaker design in this recent Remodelista post. The newest addition to the Shopdog USA lineup is a takeoff on our Morning Glory Bench. Handcrafted from locally sourced poplar, the Trillium is named for the wildflower recognized by its three delicate petals. With a nod to the utilitarian nature of Shaker furniture, the Trillium Bench promises three functions -- as a seat, a table, and as storage. Measuring 16" tall, the seat is a generous 11" deep and 19" wide. The hinged seat swings open to reveal the perfect place to store the TV remote, gaming controllers, or the dog's leash. This multi-functional and highly portable piece features delicate curves, rustic cabinet hinges, and walnut pins. Though a clean, minimalist design, countless details come together during the handmade process to form the understated whole. For example, a very subtle six-degree angle increases both the stability and the aesthetics of the bench. The legs are splayed and tapered at six degrees, and the edges of the bench top are also cut and sanded at six degrees to ensure a delicate balance with the overall design. Available in two different finishes, White as shown above, or in Marigold for a dash of color, the Trillium Bench will appeal to those who love multi-functional, easy-to-move pieces of furniture. Whether as an end table in the living room or as a bench for the entryway, the Trillium is handcrafted to last. As the holiday season picks up steam, we're excited to see more consumers choosing to shop small. There are endless choices when it comes to finding the perfect gift, yet craftsmen can offer one-of-a-kind gifts not found in the mall or on Amazon. A small bench, hand-hewn from solid wood and carefully crafted with attention to every detail becomes more than a Christmas gift. It becomes an heirloom, cherished for years, and handed down from generation to generation. A handcrafted gift shows a thoughtfulness and purpose; not simply snapping up one of a thousand others shipped overseas by Ikea. The Blue Ridge Bench is one of our most popular styles. 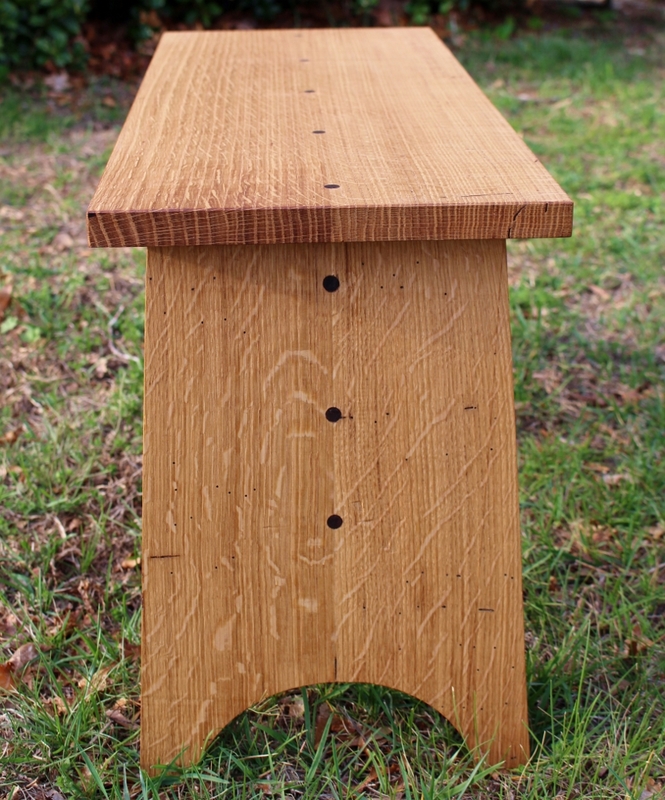 This particular bench is handcrafted from quarter sawn white oak with walnut accents. The finish is a low-luster, organic flaxseed oil and beeswax. We use only earth-friendly finishes at Shopdog USA! Leather pads added to the feet of this handy bench ensure your floors won't be scratched and provide just a hint of cushion. An old-fashioned carpenter's bench serves as inspiration for this piece which is easily moved from room to room. A carpenter could carry his tools in one hand and tuck the bench under his arm passing through doorways with ease. Perfect in a closet for dressing or by the front door to perch upon while putting on or removing shoes, the Blue Ridge Bench quickly becomes a piece of furniture coveted not only for its functionality but for its beauty. In an apartment or tiny home, small benches like these can be moved around as needed, serving as a convenient step stool in the kitchen or as extra seating in the living room. Place two side by side as a makeshift coffee table or end table. Custom sizes, different wood species, and finish colors are available. Email Tim@shopdogusa.com or call 828-407-0846 for details and price quotes.